A friend’s blog post from a while back extols the architectural merits of a St. Louis industrial park… then leadingly wonders if there might be any comparably architectural industrial park elsewhere. I haven’t managed to find a Chicago counterpart just yet, but I did turn up this place a while back. 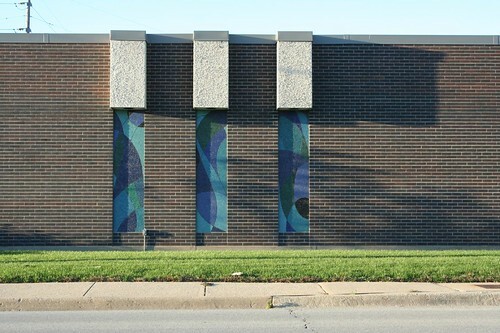 This is the building of Continental Electrical Construction Co. at 5900 W. Howard. 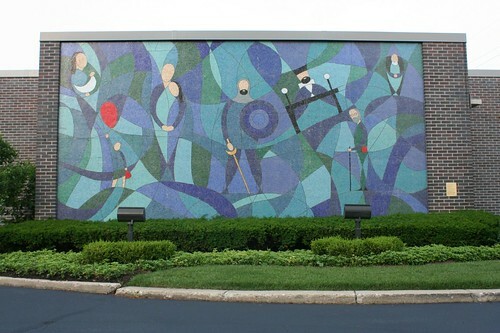 Though it is otherwise an unremarkable 1960s brown brick office building, its western face bears a mosaic tile mural designed in 1967 by Leo W. Witz, son of the company’s founder and its CEO until his retirement in 1973. 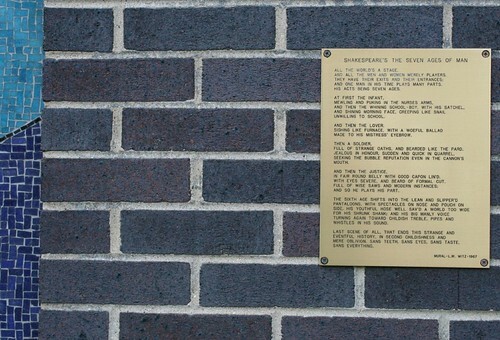 The mural, titled Shakespeare’s The Seven Ages of Man, is accompanied by a small plaque quoting the piece in question. Common to the era, it’s a highly stylized and abstracted work, combining forms, curves and colors with identifiable subject matter. The result works as both an aesthetically pleasing composition and an illustration. In a nice touch, the false window panels around the corner are filled in with a continuation of the same design. 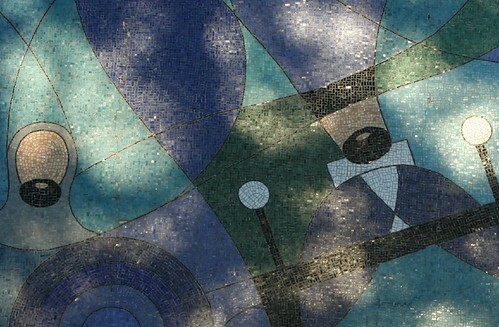 This entry was posted in industry, Midcentury Modernism, Mosaic Tile. Bookmark the permalink. I LOVE this post. How suburban industrial parks would be transformed if everyone did this: created art that was a permanent part of the architecture! And I really like this mosaic. I love your blog and sometimes I'd like to email a post to a friend. Could you enable the the email post function (in Settings)?